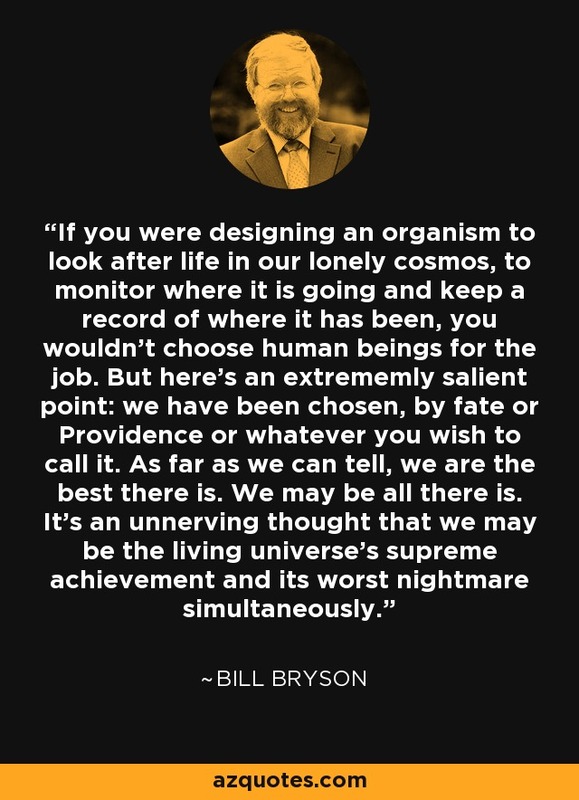 If you were designing an organism to look after life in our lonely cosmos, to monitor where it is going and keep a record of where it has been, you wouldn't choose human beings for the job. But here's an extrememly salient point: we have been chosen, by fate or Providence or whatever you wish to call it. As far as we can tell, we are the best there is. We may be all there is. It's an unnerving thought that we may be the living universe's supreme achievement and its worst nightmare simultaneously. "Bill Bryson’s ‘Really Short History of Nearly Everything’ Is The Dream Gift Book For Every Curious Kid" by Jesse Kornbluth, www.huffingtonpost.com. March 18, 2010.